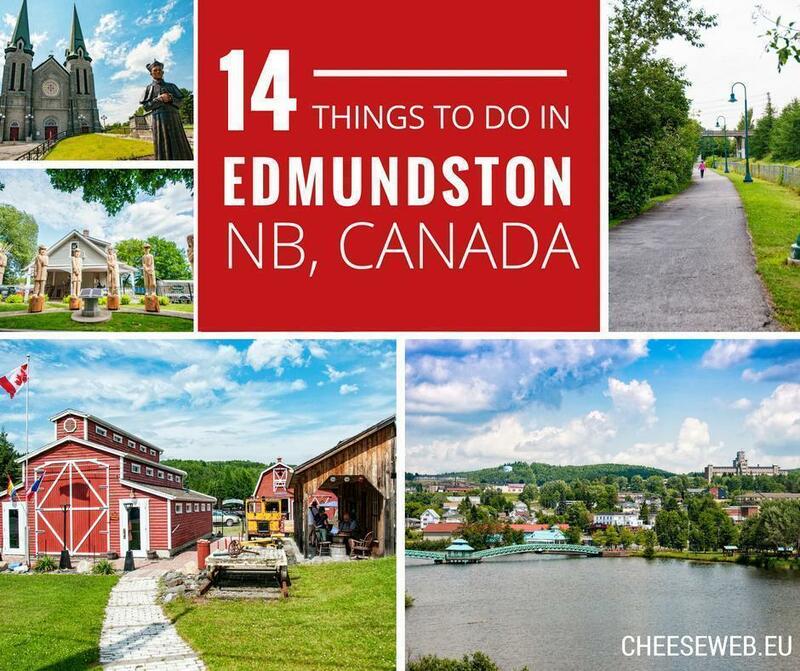 We share 14 things to do in Edmundston, New Brunswick, covering outdoor adventure, history and culture, great food, and family-friendly activities. 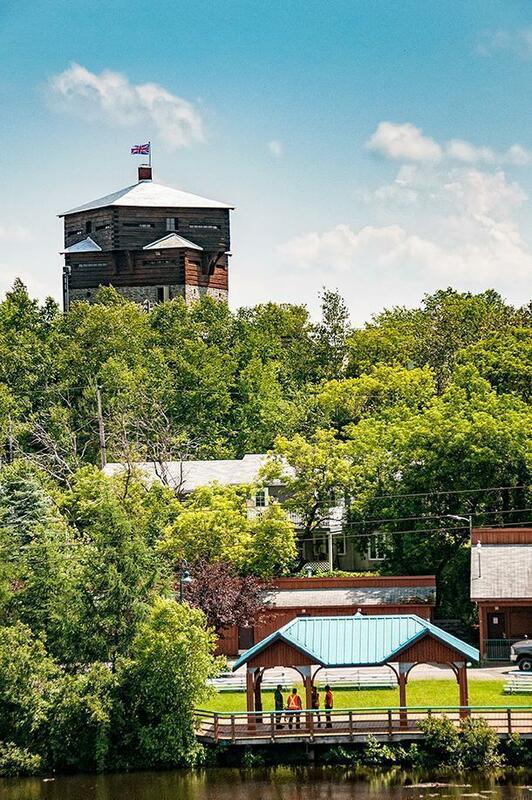 Edmundston is a hidden gem of a city in New Brunswick’s northwesternmost county, Madawaska. There’s a surprising amount of things to see, do, and experience in this small region for every style of traveller. From active outdoor adventures to a distinct culture and fascinating past to kid-friendly family fun, Edmundston has something for everyone. 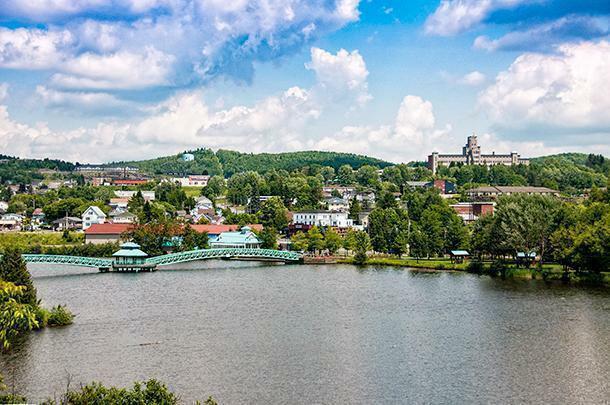 Beautiful Edmundston, New Brunswick has something to offer every traveller. In this article, we share just a fraction of the activities available to visitors to Edmundston and the surrounding Madawaska region. 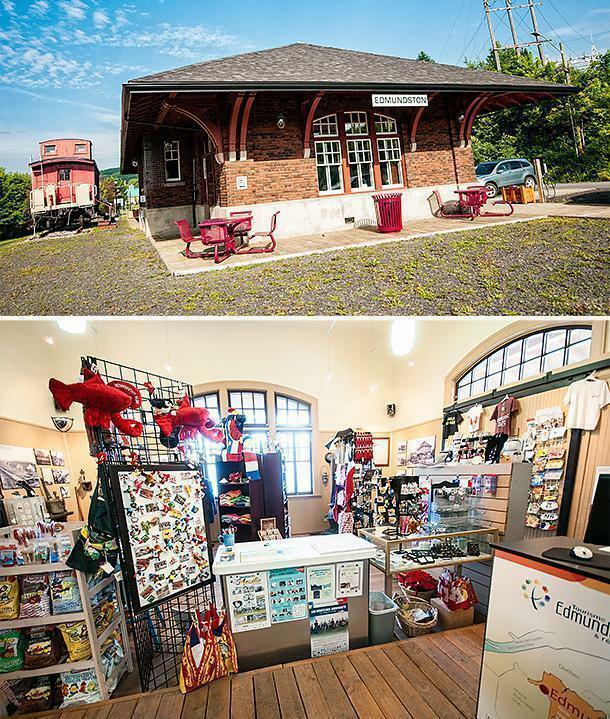 Whatever your style of travel, your trip to Edmundston should begin at the Visitors’ Centre, located in the city’s historic train station. This beautiful piece of architectural history houses all of the maps and information needed to start discovering the Madawaska region. The Tourist Office also displays informational plaques detailing the area’s history and a gift shop filled with local crafts and products. Edmundston and Madawaska County, in general, are rich in culture, history, and diversity. This list barely scratches the surface of the cultural activities available. With museums and historic sites scattered across the region, you could spend months uncovering all there is to discover. As a rule, Francophones in Canada’s Atlantic Provinces are Acadians. But although this term is used around Edmundston, the majority of people in the Madawaska region self-identify as Brayon because of their unique cultural history. The name Madawaska, meaning land of the porcupines, comes from the Maliseet First Nations people who first settled this area of the St. John River Valley. Due to its strategic location on the river, numerous communities arrived in Madawaska creating a rich and diverse cultural melting pot. 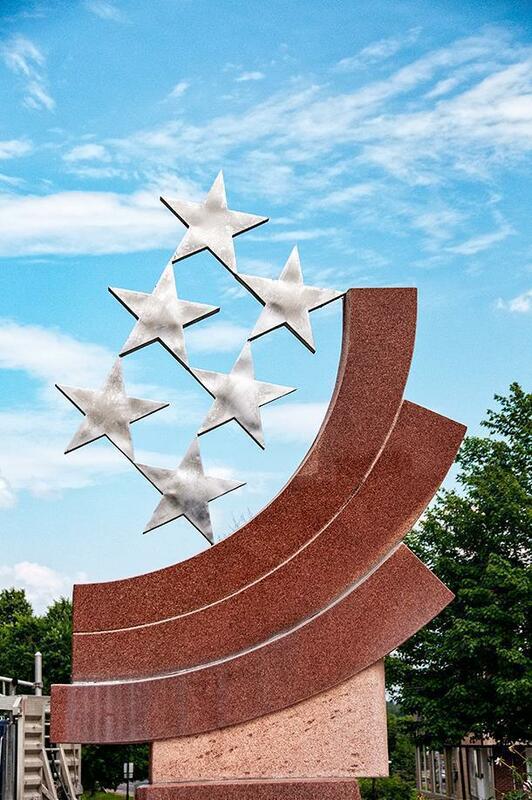 Edmundston claims six nations of founders: The Maliseet, Acadians, Quebecois, English, Scottish, and Americans all took up residence in the region. 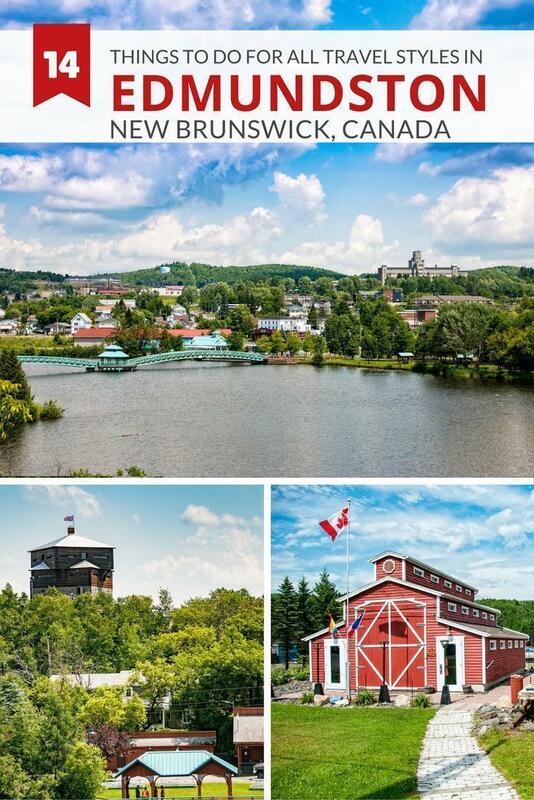 Discover the 6 founding nations of Edmundston and Madawaska County, New Brunswick. With its location at the hub of New Brunswick, Quebec, and Maine, Madawaska became the centre of a border war in the 1840s. But the people of Madawaska didn’t want to be divided by national boundaries and wished to create their own republic. Although it never came to fruition legally, the Republic of Madawaska, with Edmundston as its capital, has its own coat of arms, flag, and Order of the Kings of the Republic. The term Brayon is used to denote members of the Republic, on either side of the border, who identify with this unique heritage. Edmundston’s historic centre is easily walkable, with most of its main attractions in a six block radius. If you’re an independent sort, pick up the Leisure Walk map from the tourist office. It provides two walking routes; one focused on the city’s shopping highlights, and the Scenic Walk covers the historical highlights. The reverse side of the map gives brief details on the three main churches, The City Hall, blockhouse, and train station. 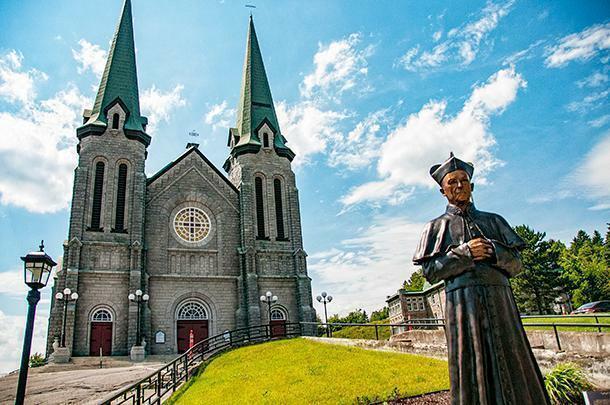 A walking tour of Edmundston will show you the city’s architectural highlights. If you prefer a side of culinary goodness with your history, sign up for the foodie walking tour at the tourist office (described in detail below). 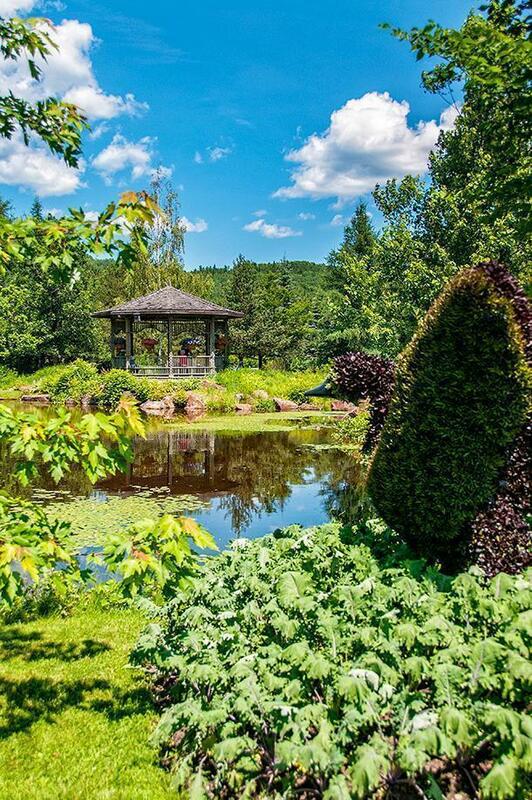 For a beautiful day out in nature, don’t miss Edmundston’s stunning Botanical Gardens. The gardens are a garden lover’s delight, with a variety of themes, art installations, classes, a butterfly house, and an excellent café. We loved them so much; we wrote an entire article about visiting the New Brunswick Botanical Gardens. The Petit-Sault (small falls) blockhouse was built in 1841 by the British army at the height of the border wars with the US. The war ended peacefully, the following year, and the fort was abandoned. Finally, the blockhouse was destroyed by lightning. It was rebuilt in 2000. Now you can visit and learn about the complicated history with our neighbours to the south. 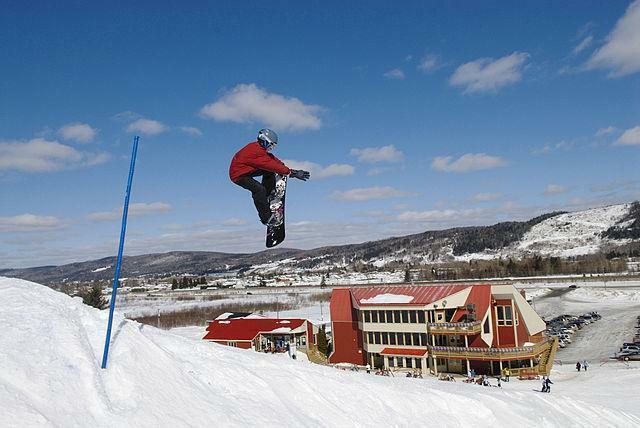 Edmundston is made for outdoor activity, and sporty travellers will love the region. Heck, we’re about as un-sporty as its gets, and we wanted to stay and explore the hiking and biking trails for many more days. 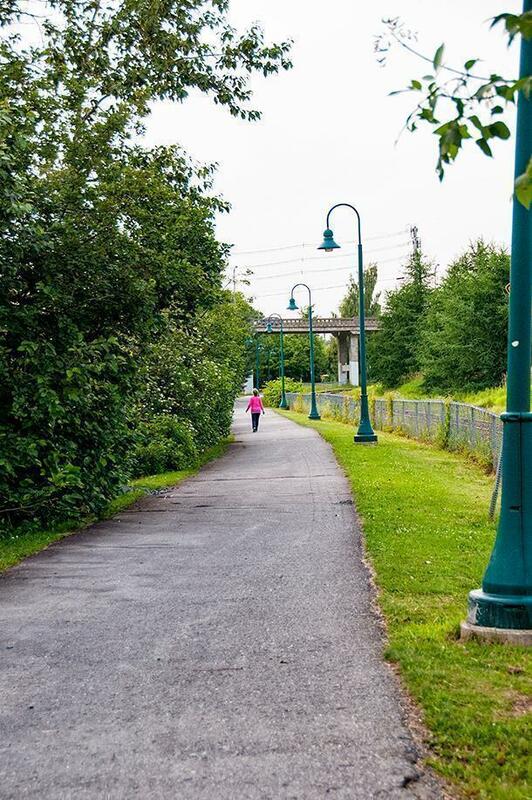 Edmundston’s section of the Trans-Canada trail is accessible to everyone. 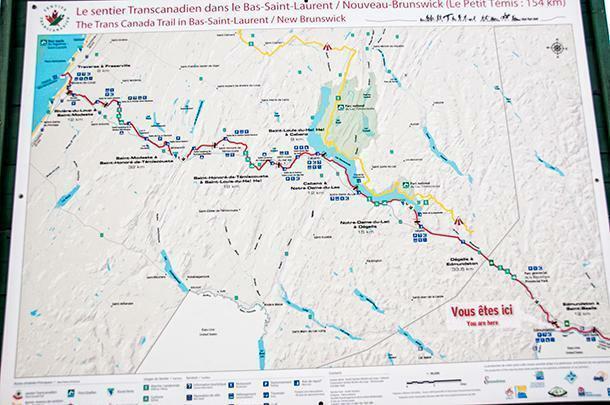 You don’t have to be an athlete to tackle the Trans-Canada Trail in Edmundston. In fact, if you take a stroll along the river downtown, you’ll technically be walking the Trans-Canada Trail. Because we had already hiked part of New Brunswick’s section of the Great Trail on the Fundy Trail, we couldn’t resist a walk on the northernmost part too. If you keep walking the trail, you can go all the way to Bas-Sainte-Laurent, Quebec; a little more than we could tackle on our weekend in Edmundston. In fact, the Trans-Canada Trail in Edmundston is two trails in one. The 134km stretch of trail from Edmundston to Riviere-du-Loup is also known as the Petit Temis Interprovincial Linear Park and is beloved by cyclists. This trail climbs from sea level up to 1000m and back down again, with plenty of gorgeous scenery and resources for cyclists along the way. Although the Petit Temis is a multi-purpose trail, there are plenty of trails in Madawaska reserved for mountain bikers. Sentiers Madawaska Trails maintains 17 trails of variable lengths totalling over 45km to get your adrenaline pumping. Visit the Velo Edmundston website for more details. We didn’t take our motorhome, Yeti, to Edmundston… yet. 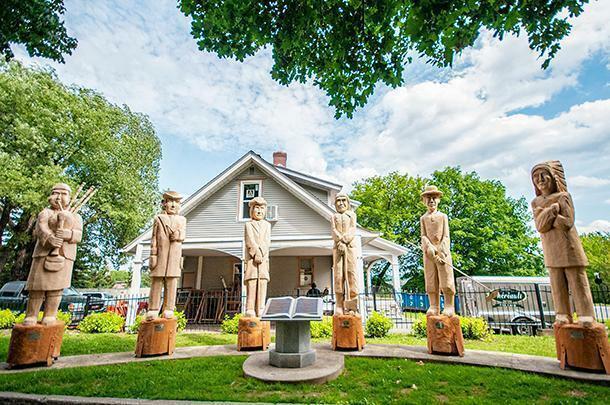 When we do, we’ll be staying at De La République Provincial Park, conveniently located next to the New Brunswick Botanical Gardens and the Antique Automobile Museum. The park has more than 150 campsites, most with electricity, as well as rustic cabins. You can enjoy the pool, tennis courts, horseshoe pits, boating, hiking, cycling, and more. There are also live events in the outdoor amphitheatre, and you’re only a few minutes’ drive from central Edmundston. 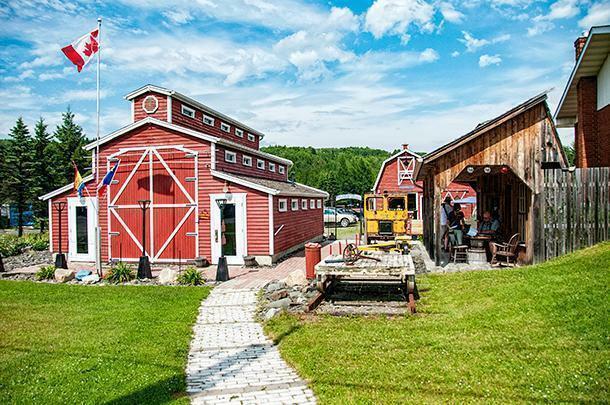 While there’s plenty to keep kids engaged at all of the locations listed above, Edmundston has a few attractions specifically geared to all ages. 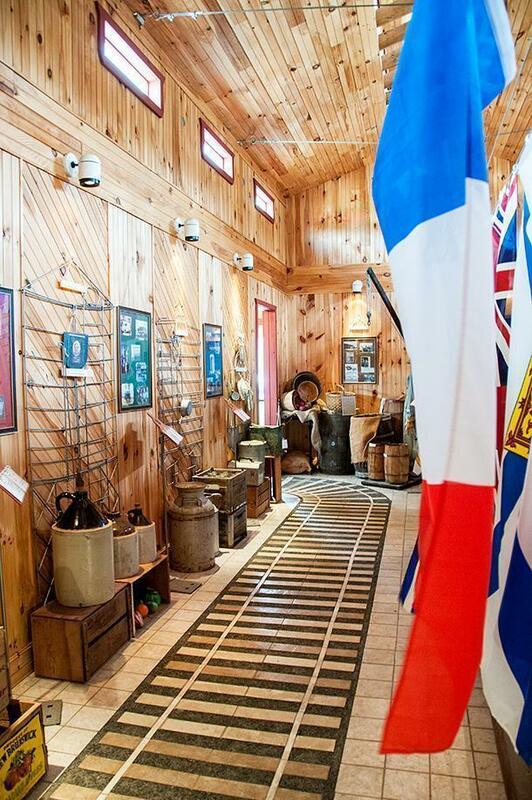 I can’t think of a better destination for young travellers than Edmundston’s Railroad Interpretation Centre. Run by train enthusiast (addict might be a better word) Guy and his wife Geraldine, this attraction immerses visitors in railroad history. First, visitors are guided through the railroad museum. Guy changes the display each year because he has so much memorabilia he can’t show it all at once! His installations are all made from recycled materials, and the bulk of his collection has been donated. Next, you move into the model railroad rooms to discover New Brunswick’s railyards in miniature. 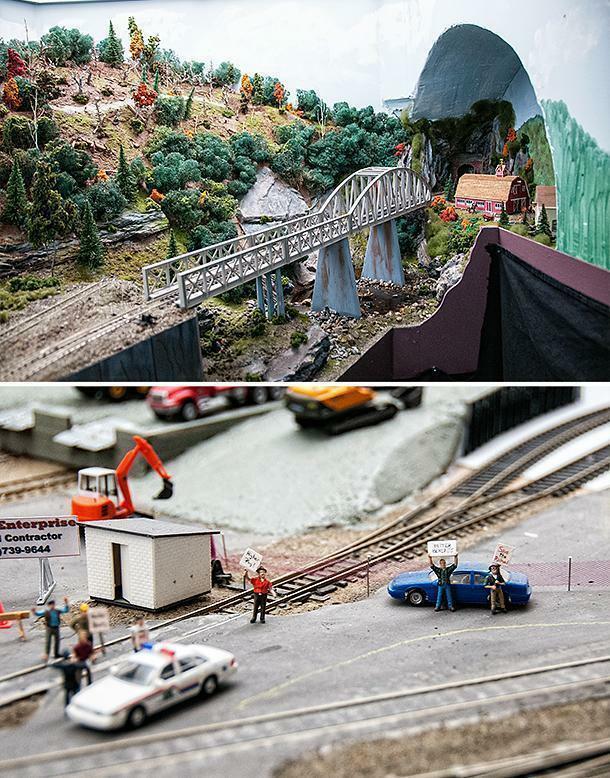 What began as a model trail hobby, grew into 1000 square feet of a tiny replica of New Brunswick’s rail network. The couple has transformed their house into train heaven. New Brunswick’s railways in miniature – right down to the striking workers. In the summer, you can even ride a 1km rail circuit around the property. While we found the Railroad centre fascinating, we can’t wait to return with our young nephews. This museum is truly a child’s heaven. Anyone interested in vehicles, young or old, will love Edmunston’s Antique Automobile Museum. 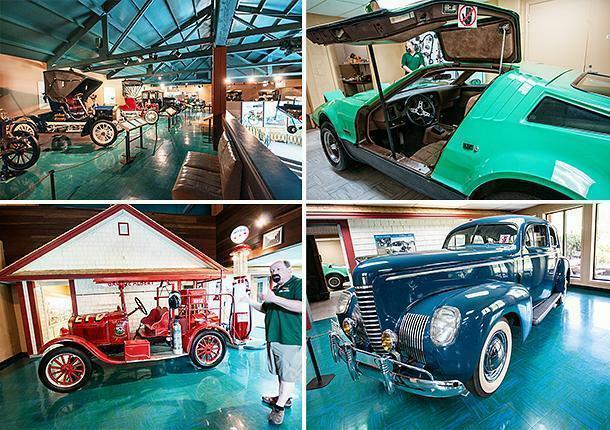 This collection of cars throughout history was once privately owned by a local businessman. Now it’s available to be viewed by the general public, in the form of an engaging guided tour. You’ll see everything from Model T Fords to an antique firetruck, to one of the few remaining Bricklins manufactured in New Brunswick; (think Back to the Future car). I could barely drag Andrew away. We visited Edmundston specifically to discover the unique culinary landscape of Madawaska County. We weren’t disappointed. Edmundston has plenty to offer the foodie traveller. In fact, there’s so much for foodies; we have two full articles to tell you what to eat in Edmundston and where you should eat it. To tempt your taste buds, here’s a sample of what the region has to offer culinary travellers. 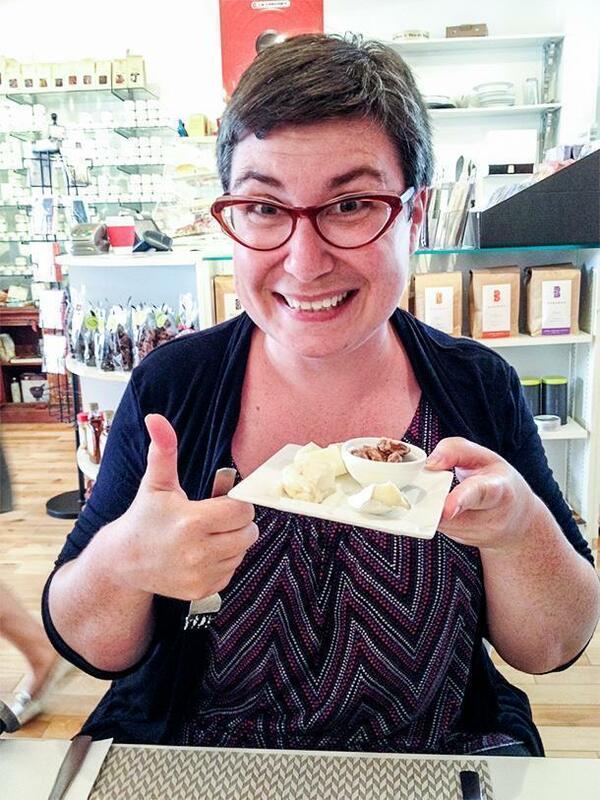 Learn about Edmundston while tasting great local products on the foodie tour! Tours leave from the Tourism Office at 2 pm Wednesday-Saturday, from July 13th to August 19th. The cost is 25$ for adults and 15$ for children from 6-12 years of age and tours are available in English or French. Maxime Albert was a local businessman whose money came from more than just the hotel he ran. Albert bootlegged moonshine, known in these parts as La Bagosse, a wickedly strong alcohol distilled from whatever fruit and vegetables happened to be handy. Albert went to great lengths to smuggle his booze into the US. Legend says he once even dressed as a priest and travelled across the border with coffins filled with liquor. 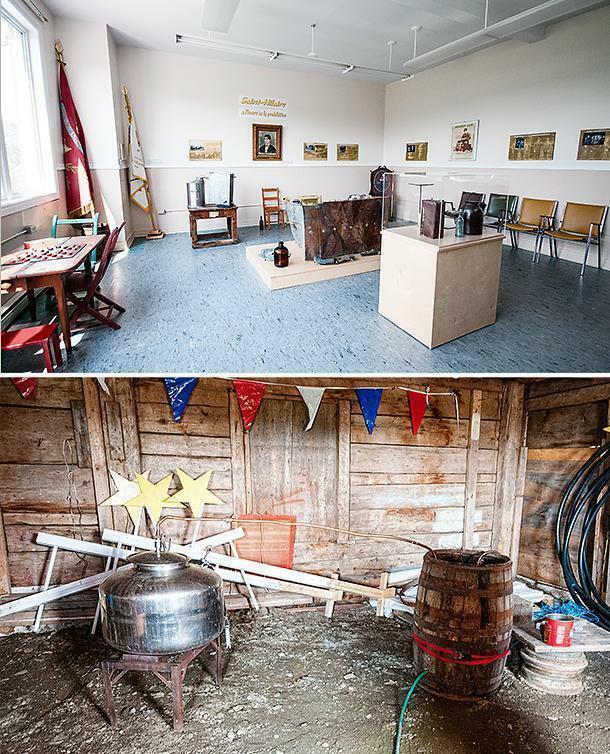 Once a year, at the Festival of La Bagosse, the people of Saint Hilaire honour Albert’s dubious tradition by brewing Bagosse in an old-fashioned still. You can learn more about this fascinating history by visiting the one-room museum in the village’s town hall. Call ahead to book a visit. If you’re visiting a new area, it can be difficult to know where to find the best local products. This isn’t the case in the Republic of Madawaska. Acadie Gourmet is a designation given to culinary ventures in the cross-border region that showcase the best food products from the area. The Acadie Gourmet label is granted to restaurants, shops, food producers, and processors, so visitors can quickly locate quality regional products. 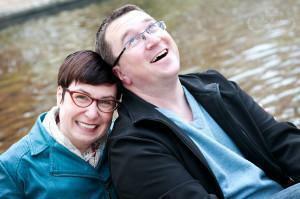 Find the best of Madawaska’s cuisine with Acadie Gourmet. 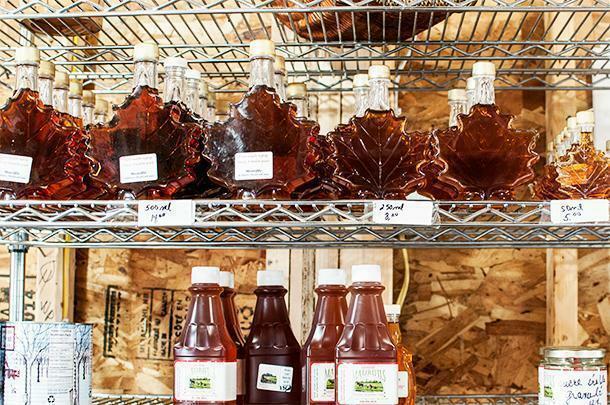 Acadie gourmet covers everything from buckwheat (essential for ployes) to maple products to meat and cheese. We go into greater detail about many of Acadie Gourmet’s designated regional products and restaurants in our other Edmundston articles. As you can see, Edmundston and Madawaska County truly offer something for every style of traveller. Don’t miss out on this little gem of a region in northern New Brunswick and stay tuned for more from culinary Edmundston coming soon. We’d like to extend our thanks to Tourisme Edmundston for hosting us in the area and allowing us to share this hidden gem with you. As always, all opinions are ours alone.